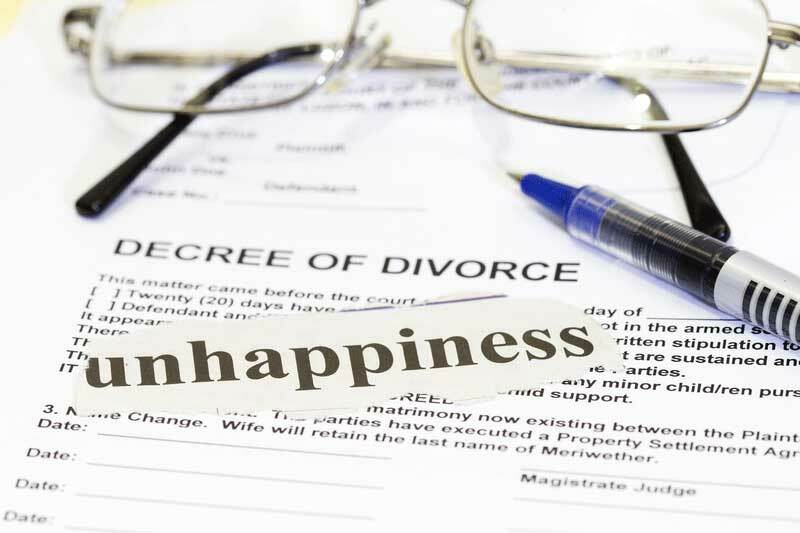 If you are involved in a divorce, the Wilson Law Firm can help you. We represent people throughout the Orlando and Central Florida area in divorce cases. We understand both the legal and emotional issues involved in a divorce and can assist you in resolving your case. Speak with an attorney today if you have a pending divorce action. Having a well prepared plan and making wise decisions prior to the start of your divorce can be crucial to its successful resolution. Unfortunately, we see cases where people waited to long to retain an attorney, believing they could handle it themselves. Only after they have made numerous mistakes, signed bad agreements or failed to resolve their case do they finally decide to retain an attorney. This ends up costing them far more then it would have had they hired a divorce attorney from the start of the case, and in many cases the mistakes they made may be impossible to correct. An experienced Orlando divorce attorney will be able to explain how the law applies to your situation and help you resolve your case in an efficient manner. If your case does require a hearing or trial, you will want to have an experienced Orlando divorce attorney on your side. An experienced divorce attorney will help present your side of the case to the Judge in a persuasive and effective manner. This will help you achieve the best results possible for your situation. To obtain a dissolution of marriage, one of the parties must be a resident of Florida for 6 months before filing the petition (unless they are a member of the military). However, simply being a resident of Florida for 6 months does not necessarily mean that a Florida Court will be able to address all of the issues in your dissolution. If one of the parties does not live in Florida or if they reside in another county, you should consult with an attorney about where to file for divorce. For more information about residency requirements speak with a Orlando divorce attorney today. If the parties are in agreement on all of the issues involved in the divorce, a simplified or uncontested dissolution may be possible. This can avoid many of the steps involved in the dissolution process. If there are contested issues, the divorce process begins with a petition for dissolution of marriage, along with other documents being filed with the Clerk of the Court. These documents are then served upon the other party. Once served, the other party must file an Answer, and if necessary a Counter-Petition, within 20 days. The Answer should address each allegation and request within the petition. A copy of any documents you file must also be mailed to the opposing party (or their attorney if represented). If the Respondent files a Counter-Petition with their Answer it must be responded to within 20 days with an Answer. It is important to note that the Court may be limited in what it can do if the petition is not pled with specificity. Also, the Court will not be able to address the sale of real estate, such as a marital residence, without a partition count being properly pled according to Florida law. Speak with a Orlando divorce attorney today for more information about petitions and counter-petitions. In some cases, the parties are quickly able to reach an agreement on all of the issues involved in their dissolution of marriage. In these situations, the case may be resolved in the matter of a few weeks. Contested cases involve more litigation in order to resolve issues and come to an agreement. When the parties cannot come to an agreement, a trial before the judge may be necessary. For more information about the time frame for a dissolution, speak with a Orlando divorce attorney today. Each party has a right to have the other party provide a financial affidavit and certain financial documentation. In cases involving child support, a Financial Affidavit will be required by the Court in order to calculate child support. Family Rule 12.285 provides a list of disclosure documents that each party is entitled to receive. In addition, in some cases additional financial disclosure will be necessary. There are a number of methods lawyers use to accomplish this including interrogatories, requests to produce, depositions and subpoenas. The Court requires parents in all divorce cases involving minor children to complete a 4 hour parenting course. It is in the best interest of the parties to attend the course as early as possible in the divorce process. For more information about parenting courses speak with a Orlando divorce attorney today. The Court will decide the parenting arrangements such as parental responsibility, time sharing, school zone district, and access to records related to the child. The standard for making these determinations is based on the child’s best interests as defined in Florida Statute 61.13. In some cases, the Court may request a parenting evaluation or appoint a guardian ad litem or other professional to assist in making it’s determination. Each party has a responsibility to support their child(ren) according to their needs and the parties’ financial abilities. This obligation usually ceases when the child(ren) turn eighteen and graduate from high school. In certain cases involving special needs, child support may extend beyond this date. In an initial determination of child support in a divorce case, the Court has discretion to award child support retroactive to the date when the parties did not reside together in the same household with the child(ren). This is not to exceed a period of 24 months preceding the filing of the petition. The Court may, after considering the financial resources of both parties, order one of the parties to pay a reasonable amount for attorney’s fees and costs to the other party. For more information speak with a Orlando divorce attorney today. Florida Statute 61.021 – Residence requirements. Florida Statute 61.043 – Commencement of a proceeding for dissolution of marriage or for alimony and child support; dissolution questionnaire. Florida Statute 61.052 – Dissolution of marriage. Florida Statute 61.061 Proceedings against nonresidents. Florida Statute 61.075 – Equitable distribution of marital assets and liabilities. Florida Statute 61.076 – Distribution of retirement plans upon dissolution of marriage. Florida Statute 61.077 – Determination of entitlement to setoffs or credits upon sale of marital home. Florida Statute 61.079 – Premarital agreements. Florida Statute 61.08 – Alimony. Florida Statute 61.16 – Attorney’s fees, suit money, and costs. Florida Statute 61.19 – Entry of judgment of dissolution of marriage, delay period. Florida Statute 61.29 – Child support guidelines; principles. Orlando Attorney Joel Wilson has has handled thousands of cases during his legal career. He understands the legal and emotional issues involved in divorce and family law cases. He is also an experienced trial attorney. Call us today for more information about our Orlando divorce attorneys and law firm. Orlando Attorney Joel Wilson has handled thousands of cases during his legal career. He understands the legal and emotional issues involved in divorce and family law cases. He is also an experienced trial attorney. Call us today for more information about our Orlando divorce attorneys and law firm. 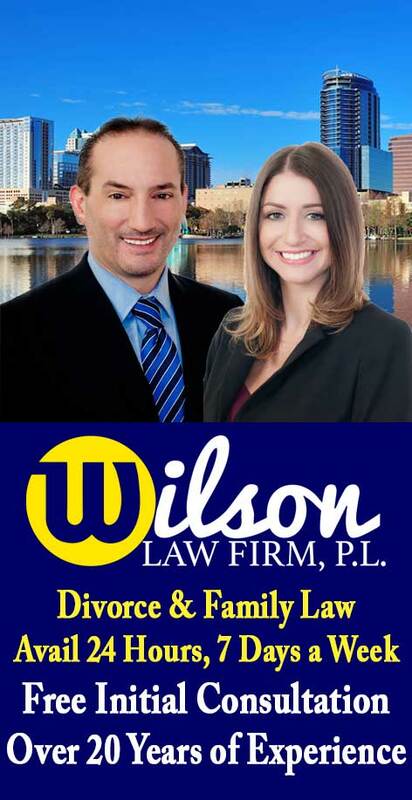 The Wilson Law Firm provides a free initial consultation where you will speak directly with an Orlando divorce attorney. Call us today to speak with an experienced Orlando divorce attorney about the legal process and your rights.